Few things are better than A) an ice-cold double IPA and B) a She's the Man/Man on Fire double feature. That's why we've gathered the best brew n' view locations from across the country -- whether they're showing old-school kung fu and serving PBR, a revival of Rio Lobo with whiskey on the rocks, or The Lone Ranger with a martini and calamari, these joints're making dreams come true. 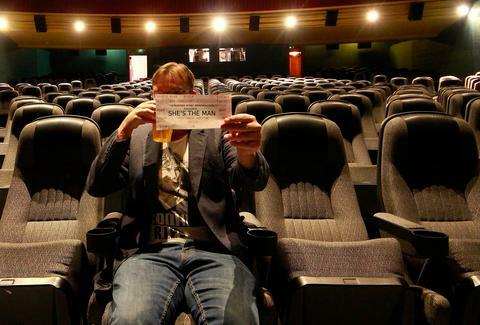 Who's the man? Amanda Bynes, that's who. 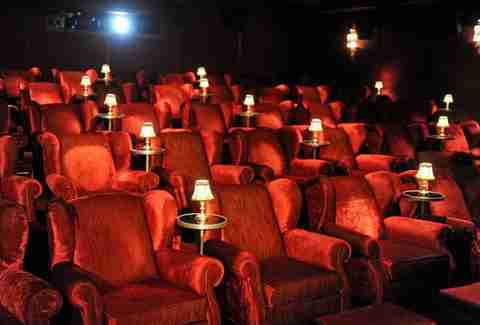 But these theaters're pretty dope too. Fast approaching its centennial (yet inexplicably not showing Bicentennial Man in anticipation), the Windy City's The Logan stripped its walls back in the day to reveal a badass old-school decor scheme under the plaster and is now fully committed to preserving the classic details... which, of course, included a sweet bar, which pours craft cocktails that you can drink during any movie, except Cocktail, because they're not showing that one either. 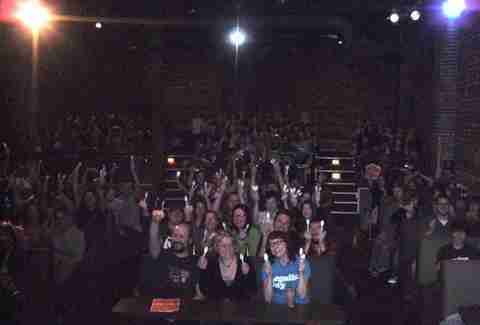 Portland has about as many theater pubs as it does employed hipsters, ranging from renovated movie houses to refurbished school auditoriums. 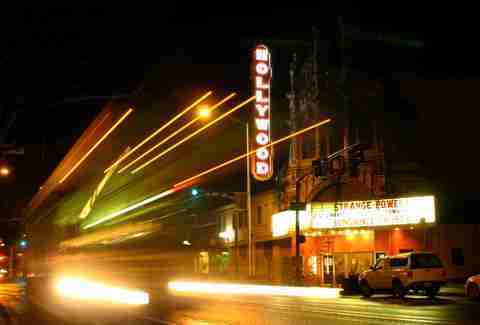 The iconic, nonprofit Hollywood, though, stands tall, and not just because of its marquee. 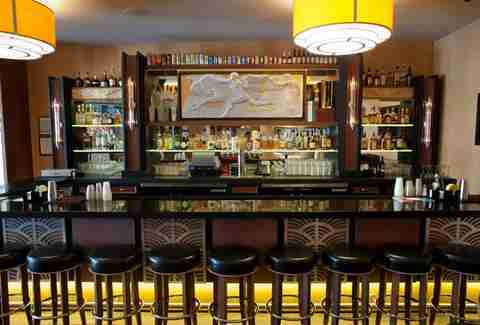 Previously known mostly for arthouse fare, the place has added booze and pizza to accompany everything from old-school kung fu marathons to sing-alongs and sleepover parties, which are especially cool when you don't have to work in the morning. Unless you're the guest of a member, SoHo House is harder to get into than the country club in Fletch (and the steak sandwiches are way better): membership at the celeb-heavy tower comes only after an intense screening process and steep dues. 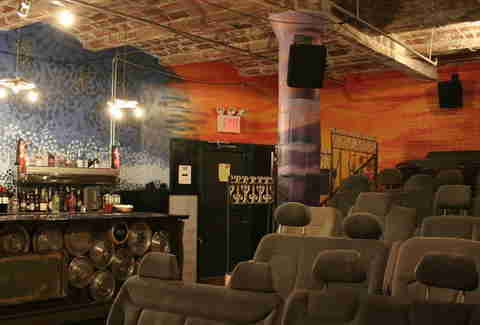 But among the awesome inside perks is this plush screening room, which hosts previews of new films, convos with directors, and a bar up front that includes booze and a pour-it-yourself candy trough. Charge it to the Underhills. 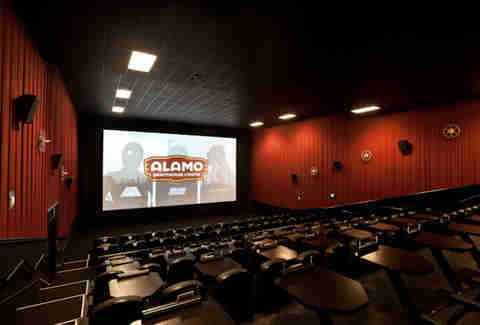 Kind of the OG of theater pubs (and a favorite of Tarantino and RZA), The Alamo's known for its tendency to launch cult hits and give overlooked flicks a second life, and for its open-armed embrace of making movies a more social hobby through the magic of alcohol... but not a social-media hobby. Bust out your phone and start texting here, and you'll be asked to go home and watch TV by yourself. That's how amazing this place is. 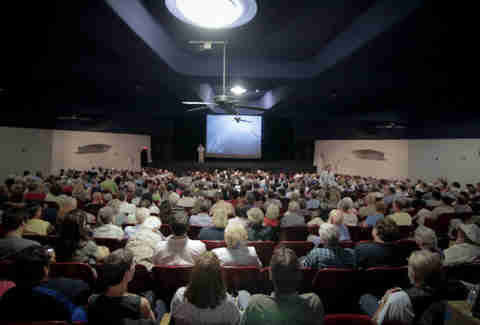 Carolina Cinemas (Asheville, NC) Sure, Asheville's known for its laid-back, Southern-hippie vibe, but Carolina Cinemas puts a Magnum-sized hole in it with annual action fests fueled by squibs and beer. 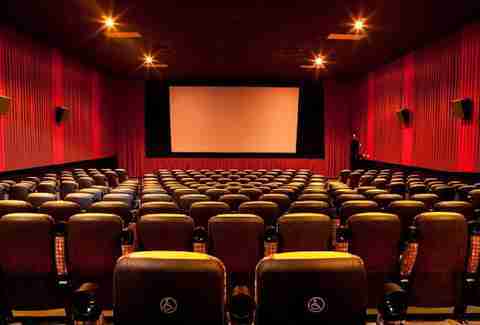 It also rocks one of the area's most high-tech sound systems and comfiest seats... because you should always be relaxed when watching gigantic, sinewy men beat each other up and crash cars. "Classic" is a pretty relative term, and any movie can be better with enough beer. That's why this Seattle institution'll show movies like Bring It On and Rebel Without A Cause to equal fanfare... after all, aren't both about the increasing frustration with impending adulthood and dance contests? There's even a matinee happy hour with discounted drinks, though the sight of James Dean dance-fighting Kirsten Dunst is still an unrealized stroke of genius. After a big renovation that represented the first time somebody's put work into a bombed-out Detroit building in four decades, the Maple's rocking 700 leather seats where you can watch everything from current blockbusters to old-school Westerns after hitting up the Maple Bar, which makes up for its lack of donuts by offering beer, cocktails, and Americanized tapas like pretzel-crusted chicken and pigs in blankets you can share with your Babe. Like the cinematic equivalent of flying first class, Look's seats come with a "call for service button", which you can press and have servers shower you with sushi and booze. Unlike first class, the food's not free (but it's super good), and the people three rows back aren't eating stale pretzels while watching Jack & Jill as their kids scream. 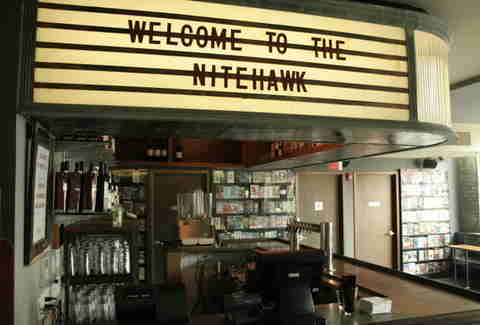 It may not be named after the 1981 Sylvester Stallone/Rutger Hauer opus, but Brooklyn's Nitehawk Cinema might actually show it during a boozy revival screening. Or, if you like your flicks artsy or exploitation-y, you can check out what new movies the smart kids are watching while chomping housemade jerky and sipping craft cocktails or PBR... Jean Renoir's drink of choice. 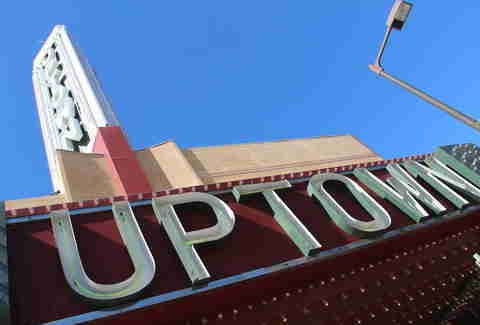 A couple years ago, this Minneapolis landmark was in such disrepair, people at screenings of The Expendables thought they were watching a California Raisins cartoon. 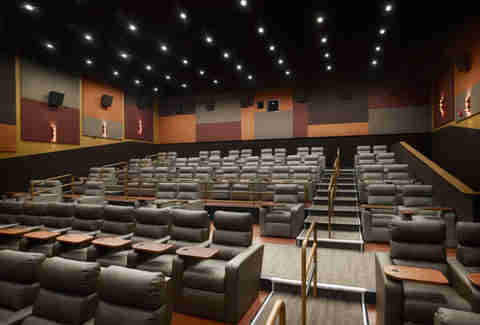 A couple years and $2 million later, it's now a top-notch, state-of-the-art theater with pictures so clear, watching Stallone and Schwarzenegger running around just makes you sad. Luckily, there's a full bar to help those wrinkles blur together after a while. A historic Dallas landmark made historic-er as the place where Lee Harvey Oswald was eventually arrested (presumably for texting during a screening of From Russia With Love), a recent renovation of the Texas Theatre updated the joint with a bar showcasing local spirits and beers that you can take into the theater during screenings of blockbusters, indie flicks, and revivals of old-school flicks that you should really not text during. 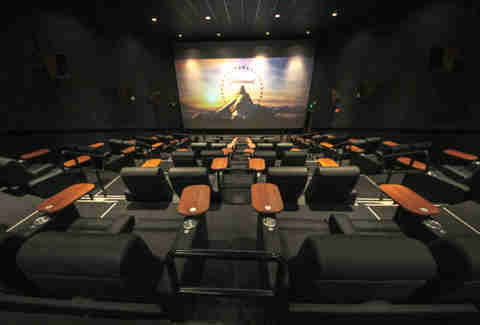 There're luxury theaters, and then there're luxury theaters that pretty much seem to have their own economy, like this multiplex w/ an award-winning, 100-seat,d Italian joint, full bar, and in-theater recliners w/ computer screens that allow you to order concessions like cocktails and food without getting up an missing a single hilarious minute of The Oogieloves in the Big Balloon Adventure. 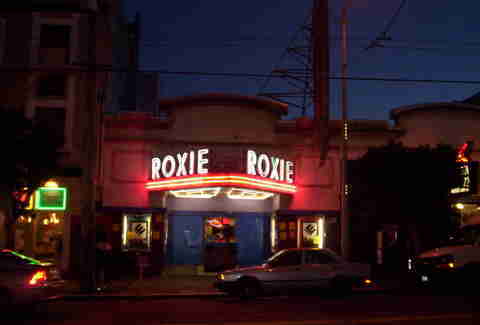 It took the Roxie more than 100 super-dry years of existing before realizing that nothing goes better with obscure foreign and indie movies than beer and wine. 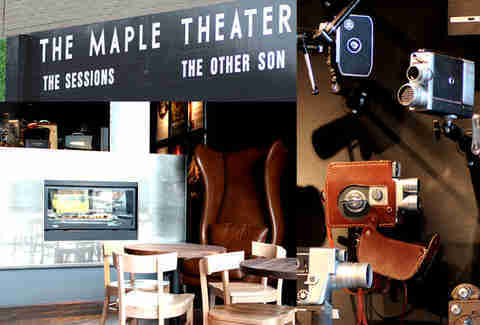 Or, if you want to watch something super artsy and obscure (like a Roadhouse/On the Road double feature), you can rent the place out for private screenings. Presenting all the fun of a drive-in without all the stupid driving and sitting in a car, ReRun's stadium-style seating's made of refurbished car seats, where you can lounge while watching independent movies, quaffing beers, and stuffing your face with handmade hot dogs full of stuff like duck confit. Afterward, continue the not-driving thing in the subway. 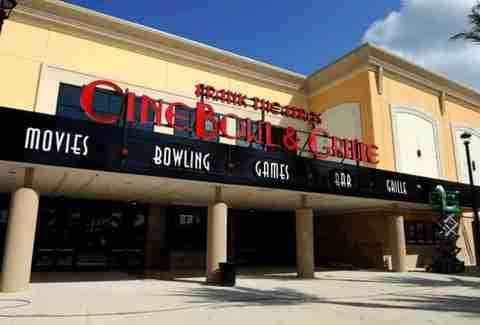 Showing new movies in an ultra-modern multiplex and not, inexplicably, a continuous loop of scenes from The Big Lebowski and Kingpin, the Cinebowl makes up for its inherent John Goodman-less-ness by complementing the theaters w/ bowling lanes and all the glorious booze that comes with them. Plus, the ushers totally will be impressed with all your Walter quotes, and maybe they'll give you a free beer instead of an eye roll.